Sweet Sentiment: What a little Tweetie Pie! What a little Tweetie Pie! 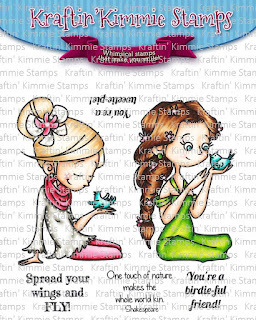 Welcome to Day ONE of the March Release at Kraftin' Kimmie Stamps! Today we're going to knock your socks off with a super sweet set of lovely ladies from artist Emilie Goulet! It's called TWEETIE PIES!!! I'm super excited to share this one because.....some of you have seen it already! That's because it was the Super Secret Krafty Klub stamp set for January!!! So those who preordered it already have it in their inky little fingers! I used DSP from Doodlebug "Happy Camper" 6x6 pad. I just adore this piece of paper so I colored this sweet little girl to match the paper. I made a gate fold card, which is something that I NEVER do, but I just love how it turned out! Of course I used my copics to color her up, ties a little bow with some bakers twine and used some enamel dots also from Doodlebug. I hope you love it as much as I do! 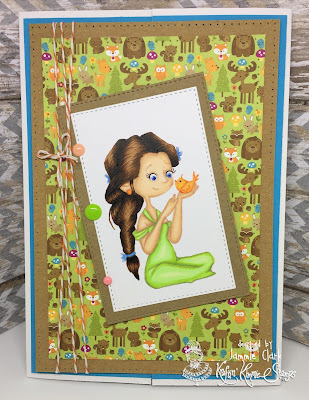 This adorable set features two main spring themed images plus four fabulous coordinating sentiments! Be sure to join us at the LIVE Online Release Party on Saturday morning at 11am EST! We'll be checking out ALL of the SIX new clear stamp sets, sharing fabulous creations, giving away prizes and having tons of krafty fun! 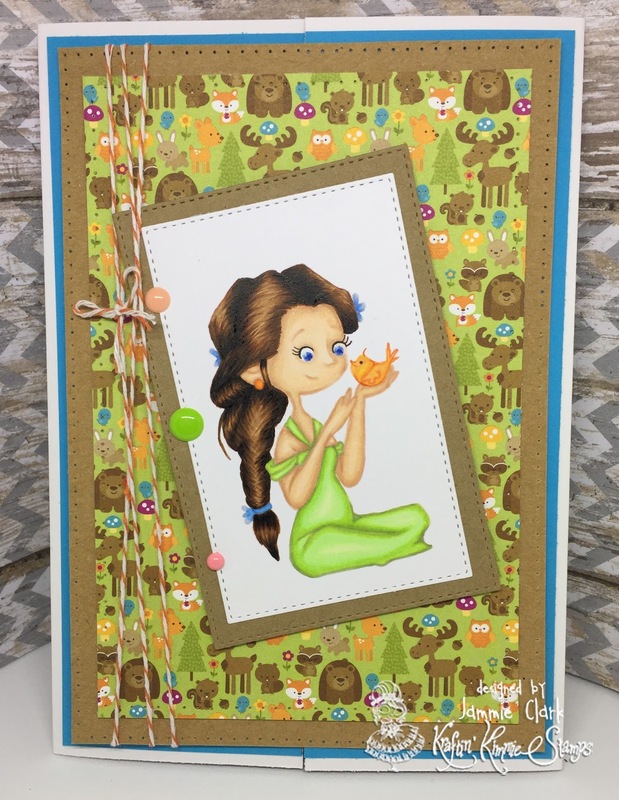 All of the Krafty Krew design team members and Krafty Guests listed below have lots of sweet designs to share with you today featuring the TWEETIE PIES stamp set! Be sure to hop around and leave lots of love at each and every stop because one lucky commenter will WIN a gift voucher to the krafty shop! The winner will be announced at the party so don't miss it! Great job! Love the paper you used! Love the colours, this card would be perfect for a little girl who is a bit on the wild side!! THis is so beautiful and I am so excited for you. You deserve to be on the DT as your coloring is awesome and you love their stamps. So proud of you pal! She matches the image! Cool! This is fantastic! I am always amazed with the look of the no line coloring! have never tried it though! Thanks for the inspiration! Pretty card! Love the green dress and coordinating colours you used. stunning work and super congrats on DT!